Product waste in hygienic manufacturing industries such as food and beverage, pharmaceuticals and cosmetics has long been accepted as an unavoidable cost of doing business. The problem is that flushing or draining raw ingredients or intermediate/finished products that remain in suction and discharge piping at the end of production or during product changeovers is the same as watching money go down the drain. The key to eliminating this waste is identifying and deploying the most efficient and reliable pumping technology that can strip suction and discharge lines of still useable raw materials and saleable end products. 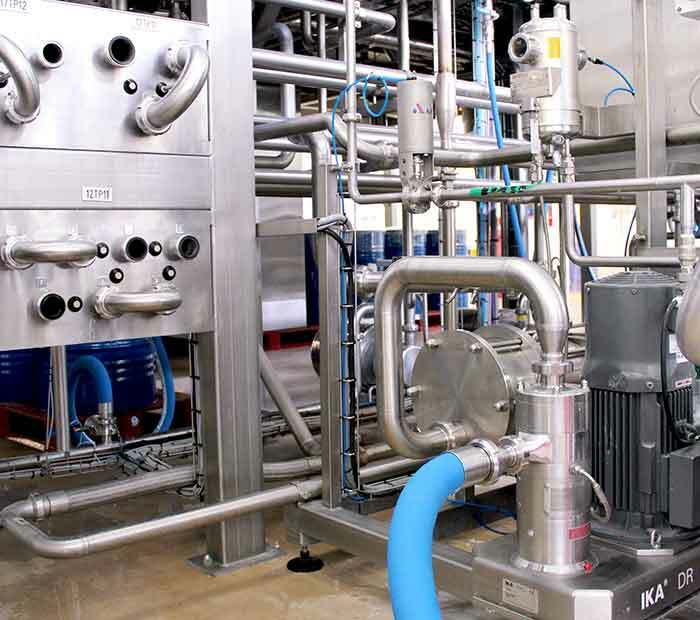 Technologies such as lobe, external circumferential piston (ECP), twin screw, centrifugal, hose and progressive cavity-style pumps have routinely been used in hygienic manufacturing. Another choice is the eccentric disc pump. The pump’s operating principle—a disc revolving on an eccentric plane within a circular channel—gives it the ability to function in a nonpulsing, low-slip manner with high volumetric consistency. Eccentric disc pumps are also able to pump air, which creates a vacuum effect on the suction side and a compressor effect on the discharge side, resulting in the ability to push a complete product “plug” out of the piping without the need for expensive pigging systems or other line-clearing solutions. Bailly Lapierre in Saint-Bris-le-Vineux, France, produces Crémant de Bourgogne, a white or rose sparkling wine made mostly from pinot noir and chardonnay grapes. When the facility was upgraded, eccentric disc pumps were chosen for several stages that require high, nonpulsing flow rates with strong volumetric consistency and minimal slip. The evolving combination of a strict manufacturing process and a change in the makeup and viscosity of finished ice cream products recently caused ice cream manufacturer Ysco, of Langemark, Belgium, to question its current pumps. The higher viscosities required a stable, nonpulsating flow and high volumetric consistency. The solution was a sealless eccentric disc pump that would reduce the risk of contamination and leaks while maximizing product recovery. Headquartered in Tokyo, Japan, Shiseido has operations all over the world. Its operation in Ormes, France, transfers up to 4 tons a day of high-value raw materials for the manufacture of perfumes, face and body creams, shower oils and gels, and liquid makeup removers. Ensuring gentle handling while minimizing loss is a daily challenge. Optimizing product quality, operational sustainability and manufacturing costs are the driving forces at Coca-Cola’s Hellenic Bottling Company (HBC) plant in Dunaharaszti, Hungary. A key link in the facility’s production chain involves the unloading of tankers laden with raw ingredients that will be transformed into popular drinks like Coke, Sprite, Nestea iced tea and Powerade sports drinks. Recently, the twin screw pumps in use were freezing up, delaying strict production schedules. The solution: replacing the screw pumps with eccentric disc pumps. A large United States-based baked goods manufacturer that produces nearly 600 products was having problems with a leaking pump. A circumferential piston pump used to distribute chocolate coating over cookies was experiencing leaks every two weeks, resulting in the loss of 100 pounds of coating and interruption in production. The problem was solved with a sealless eccentric disc pump with pressure and flow switches that would eliminate the leaks. By 2012, Surly Brewing in Brooklyn Center, Minnesota, needed to upgrade and expand its manufacturing operation. The new beer-making equipment, along with Surly’s brewing method that does not involve any filtration, led to the search for a pumping technology that could steadily push the beer in an even, nonpulsating manner. The solution was found in the eccentric disc pump. Manufacturers of food and beverage, pharmaceutical and cosmetic products that rely on hygienic systems should determine how much cost savings can be realized in targeted product recovery. The solution may be the eccentric disc pump, which offers line-clearing and stripping capabilities, resulting in less product waste and improved cost effectiveness. Read more Efficiency Matters articles by clicking here. Johann Fourrat-Besson is the industry product manager for Mouvex and PSG. He may be reached at johann.fourrat-besson@psgdover.com or +33 386 498 669. For more information, visit www.mouvex.com or www.psgdover.com.